Place potatoes in a large saucepan, cover with water and cook until tender; drain well and mash adding milk and salt. While potatoes are cooking, melt butter in a skillet. Add onion; cook 10 minutes, stirring occasionally until soft. Add cabbage; cook and stir for 5 minutes more or until soft. Stir cabbage mixture and cheese into hot potatoes and season with pepper. 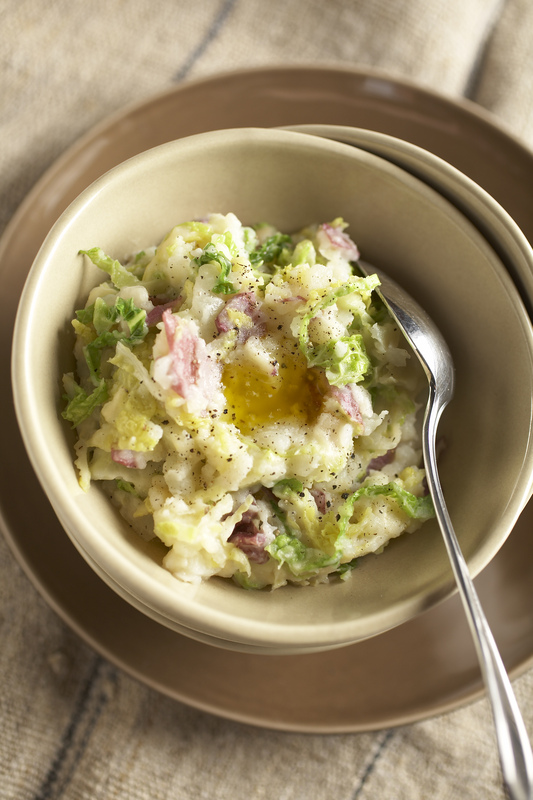 Mound colcannon onto serving plates (or a large bowl) and make a well in the center of each – fill with melted butter, if desired. Makes 8 servings. Combine brown and white sugar, then honey and milk. Cook over a medium heat until mixture comes to a boil. Reduce heat and cook to a soft stage (225 degrees). Remove candy from the heat and let stand 10 minutes. Stir in pecans and rum. Let pralines dry until firm. Then peel away from paper. In a large bowl, stir together the flour, cornmeal, sugar, baking powder and salt. Make a well in the center of flour mixture and pour in the egg, buttermilk, and baking soda. Mix until everything is smooth and well blended. Pat the hot dogs dry with paper towels. Insert wooden sticks into the ends. Dip the hot dogs in the batter one at a time, shaking off the excess. Deep-fry a few at a time in the hot oil until they are as brown as you like them. Drain on paper towels. Serve with a yellow salad mustard. Makes 10 corn dogs. Bake cake according to package directions in a 9 x 13-inch pan. Remove from oven and cool 5 minutes. Poke top of cake with a large meat fork (not a dinner fork). Open Jell-O and pour separately into two bowls. Mix 1/2 cup boiling water with Jell-o mix in each bowl and stir until mix dissolves. Stir a 1/2-cup of the cold water into each. Pour each over top of cake, allowing Jell-O to run into the holes poked into the cake top. Refrigerate for at least 3 hours. Spread top with whipped topping and decorate, if you wish with fresh strawberries and blueberries. Serves 12. Derby Day Mint Julep – The Quintessential Southern Drink. Nothing is more refreshing than sipping on a mint julep while watching the Kentucky Derby on the first Saturday in May. The prefect julep is traditionally served in an ice-cold sterling silver cup with a spring of mint. “The julep has its roots, surprisingly, in the Arab world,” said Chris Morris, Master Distiller for Woodford Reserve Bourbon and American spirits historian. When the julep was introduced to the Mediterranean region, the native population replaced the rose petals with mint. The mint julep, as it was now called, grew in popularity throughout Europe. Traditionally the mint used for a Mint t Julep at the Derby is Kentucky mint, a softer tasting mint than what most folks grow in their backyard herb gardens. The juleps popularity came to rest in the agricultural regions of the east and southeast, where farmers awakened at dawn. Juleps were originally a morning drink. It was the spirited equivalent of coffee in today’s society. Like the farmers, the horse trainers were up early and would prepare the julep first thing in the morning. Through the years, the drink started showing up at regional horse races, where the mint julep made the transition from a morning drink to a “sipping” cocktail. Certainly, no Kentucky Derby would be complete without this venerable cocktail. Woodford Reserve Bourbon is the “Official Bourbon” of the Derby. Mix up a batch of mint juleps and serve with a platter of Kentucky Country Ham Toasts. It will prove a winning double to serve your quests on Derby Day. Muddle (stir/gentle crush) four mint springs and sugar in the bottom of a julep glass. Add water, continuing to muddle contents to a paste. Add Woodford Reserve Bourbon. Pack the julep glass with crushed ice. Garnish with a mint spring for and don’t forget the sipping straw. If a metal julep cup is used, be sure to use a wooden muddler (bottom of a wooden spoon) instead of metal spoon to eliminate the possibility of scratching your julep cup. Place ham on toast and dollop with mustard. Garnish with red pepper slice. Combine all ingredients in a small mixing bowl and mix well. Mix milk, brown and white sugar together and bring to a boil in heavy boiler. Mix corn starch, evaporated milk and egg yolks together. Add to milk mixture and stir constantly until thick. Add salt and remove from stove. Beat in peanut butter and vanilla until blended. Beat egg whites and cream of tartar until stiff and fold in. Pour into baked pie shells. Cool and cover with whipped topping. Yield: 2 pies. Add enough water to a medium saucepan to come about 1-inch up the side. Bring to a simmer over medium-high heat. Measure citrus juice and if needed, add enough cold water to reach 1/3 cup. Add juice and zest to egg mixture and whisk smooth. Once water reaches a simmer, reduce heat to low and place bowl on top of saucepan. Whisk until thickened, approximately 8 minutes, or until mixture is light yellow and coats the back of a spoon. Remove promptly from heat and stir in butter a piece at a time, allowing each addition to melt before adding the next. Remove to a clean container and cover by laying a layer of plastic wrap directly on the surface of the curd. Refrigerate for up to 2 weeks. Courtesy of Cassy Vires of Home Wine Kitchen in Maplewood. Take mini fillo shells (in the frozen food section) and thaw. Fill the fillo shells about 1/2 full of your favorite goat cheese. Place about ½ of a Bacon Caramel from The Caramel House on top of the goat cheese. Bake for about 3 minutes in the oven or until the caramel has melted. They are so good they will disappear faster than you can make them! Courtesy of Janet Shulman of The Caramel House. Click on the link for the recipe for the 2012 Pillsbury Bake-Off winner, Pumpkin Ravioli with Salted Caramel Whipped Cream. Suzanne Corbett was in Orlando this week for the Bake-Off. She’ll be on Food Talk STL this Saturday to talk about the experience. Two Nice Recipes for Springtime from Ginger Gall of Dierberg’s School of Cooking! Place greens on individual salad plates or large platter. Top with oranges, strawberries, pecans, and choice of cheese, if using. Drizzle vinaigrette over salad. Serve immediately. In small bowl, combine honey and pepper. In medium skillet, combine nuts with honey mixture; cook over medium heat stirring constantly until nuts begin to brown and most liquid from honey has evaporated and coats nuts nicely. Transfer nuts from skillet onto parchment paper. Cool for 10 minutes. Refrigerate any leftover nuts. Combine all vinaigrette ingredients in work bowl of food processor fitted with steel knife blade; process until smooth, about 30 seconds. Cut chicken breasts into about 1-inch chunks; set aside. In shallow dish, combine flour, paprika, salt, and pepper; mix well. Place cream in second shallow dish and panko in third shallow dish. Dip chicken in cream, dredge in flour mixture, dip in cream a second time, and then coat with panko. In 1-cup measure, stir cornstarch into water until dissolved. In medium saucepan over medium-high heat, bring chicken stock to a boil. Slowly stir in cornstarch mixture and cook for 1 minute or until sauce has thickened. Add oyster sauce and stir to combine. To serve, spread cooked rice on platter. Arrange chicken evenly over rice, ladle sauce over chicken, and garnish with cashews and green onions. I want this: Cornbread Bruschetta with Black Beans and Feta. Linked from the Bush’s Beans website. Want to prepare something Irish for St. Patrick’s Day? Click here for a Shepherd’s Pie recipe from Delish.com! Cream softened butter and sugar. Add eggs and blend well. Add Vanilla. Pour batter into 9×13 greased pan. Bake at 325 degrees for 50-55 minutes. Place jack salmon in a shallow dish. Pour milk over fish, add lemon slices; cover and chill for an hour. Mix together the cornmeal and flour and place in a shallow dish. Remove fish from milk, season with salt and red pepper; set aside. Beat together the egg and 1/4 cup milk; dip fish in egg mixture, then roll into cornmeal mixture. Using a deep fryer or skillet, set at 375 degrees or medium high, deep fry fish in hot oil until golden brown. This takes about 5-8 minutes. Remove from oil, drain on paper towels. Heat together barbecue and worcestershire sauces. Serve warm red sauce with fish. Makes 2 – 4 servings, depending on the size of the jacks. Tips: If the oil begins to smoke it’s too hot and a sign that the oil is breaking down and will affect the flavor of the food fried. Optimum cooking temperature for fish is about 375 – 380 degrees. Small batches are easier to control while large batches can lower oil temperatures, preventing perfect frying. Also, have on hand the right tools to place fish in and out of oil. Such as log handled tongs, slotted spoons or a fry basket. When using these tools dip them in the hot oil first before using, which will prevent food from sticking to them. Keep fish warm by placing in a single layer on a rack placed on a baking sheet in a 275-degree oven. Click here to get the recipe for Monkey Bread made with Andrea’s Gluten Free Biscuit Dough! This is one of the most popular of the many gluten free recipes listed at AndreasGlutenFree.com. Sprinkle with half the Creole seasoning. Heat oil in a large Dutch oven over a medium high heat. Add chicken and cook until browned on all sides; remove chicken and set aside. Reduce heat to medium and add sausage to Dutch oven; cook until browned on all sides. Remove sausage and set aside. Reduce heat to medium, then whisk in flour into pan drippings. Cook for 5 – 10 minutes, stirring constantly, or until mixture turns dark brown. Stir in onions and cook for 5 minutes, stirring often. Add in peppers and garlic and continue to cook for 3 – 5 minutes, or until peppers are tender. Stir in water, red pepper and remaining Creole seasoning; mix well and bring to a boil. Add chicken and sausage and return to a boil. Reduce heat and simmer 30 minutes. Meanwhile, cook rice according to package directions. When Gumbo is done, season to taste with addition pepper or hot sauce. Garnish with green onion and parsley. Gently stir in the clams, mussels, shrimp, scallops, fish fillets, and crab meat to the prepared stock. Cover and simmer 5 to 7 minutes until clams pop open and shrimp are opaque when cut. NOTE: Do not overcook the seafood (the seafood continues to cook after it is removed from the pan). Remove bay leaves; season with salt and pepper to taste. Remove from heat and ladle broth and seafood into large soup bowls and serve. Makes 8 to 10 servings. Recipe can be cut in half. Place potatoes, onions, bay leaf and water into a large saucepan. Drain canned clams juice from clams into potato mixture. Bring to a boil, reduce heat and cook until potatoes are tender. Season with salt and pepper. Remove bay leaf and process mixture until smooth. . Return to stockpot, set aside. Fry bacon until crisp. Remove and add to potato mixture. Add butter to bacon drippings and whisk in flour Stir into potato mixture. Add clams and cream and milk. Cook over a medium heat until thicken. Season with salt, pepper,Tabasco to taste and reserved bacon. Sprinkle with chopped chives to garnish. Love Suzanne Corbett! Would love to hear on your show again.